Sun Rithy’s father and grandfather were both performers of the Lakhon Khol masked dance, but the ultra-Maoist Khmer Rouge – who scorned most art as decadent – banned its study when he was a child in the 1970s. Now 48, Sun Rithy leads one of the last Lakhon Khol troupesin Cambodia, made up of about 20 performers and students aged six to 15. For him, teaching a new generation is a matter of survival for the tradition. “I don’t want Lakhon Khol … to go extinct,” Sun Rithy told Reuters. 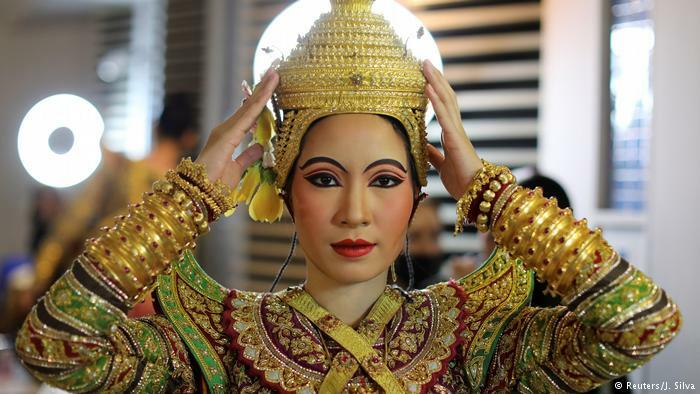 A dancer poses backstage before a performance of Khon in Bangkok, Thailand. Thailand’s Khon tradition, originally centered on the royal court, is now taught by many schools and universities. Lakhon Khol was recently listed by UNESCO, the United Nations’ cultural agency, as an intangible cultural heritage, along with neighbouring Thailand’s version of the dance, known as Khon. There are different variations in Southeast Asia, all featuring dancers wearing elaborate painted masks depicting the Ramayana, a Sanskrit epic poem in which a prince rescues his wife from a demon with help from an army of monkeys. But in Cambodia, the art form is still struggling to recover from the Khmer Rouge, under whose genocidal 1975-79 rule at least 1.7 million people, including artists, dancers and writers, died, mostly from starvation, overwork, disease, execution or torture. “In the Khmer Rouge, I was young and they didn’t teach people dance. Lakhon Khol was destroyed,” said Sun Rithy, who started to learn the dance when he was 14, after the Khmer Rouge were ousted from power. Ahead of a recent rehearsal, students stretched their legs and hands at the troupe’s a newly built theatre at Wat Svay Andet, a Buddhist temple outside the capital, Phnom Penh. Pum Pork, 49, said his 11-year-old son, Pum Meta, was attending the dance class. “I want to have my son trained to perform so that in the future we won’t lose the ancient art,” he said. Cambodian Minister of Culture and Fine Arts, Phoeurng Sackona, said that the dance needed immediate preservation and urged all people to get involved. 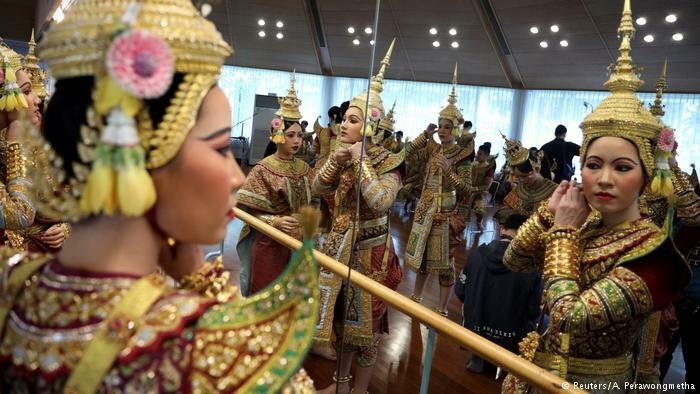 Dancers are seen on stage during a performance of Khon in Bangkok, Thailand. 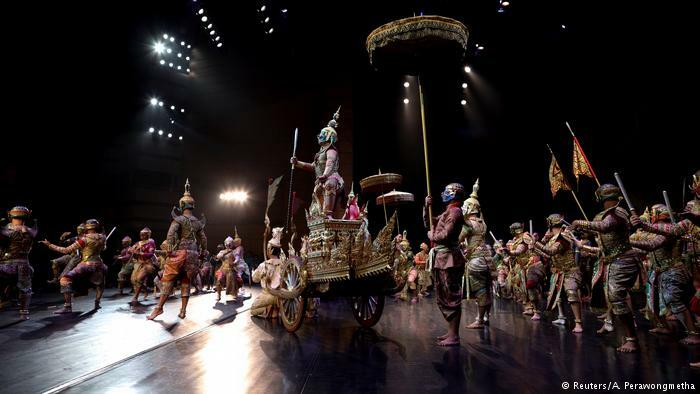 There are different variations in Southeast Asia, all featuring dancers wearing elaborate painted masks depicting the Ramayana, a Sanskrit epic poem in which a prince rescues his wife from a demon with help from an army of monkeys. Thailand’s version of the dance has fared better than its neighbour’s, but practitioners still depend on recruiting a new generation of performers. Thailand’s Khon tradition, originally centred on the royal court, is now taught by many schools and universities. 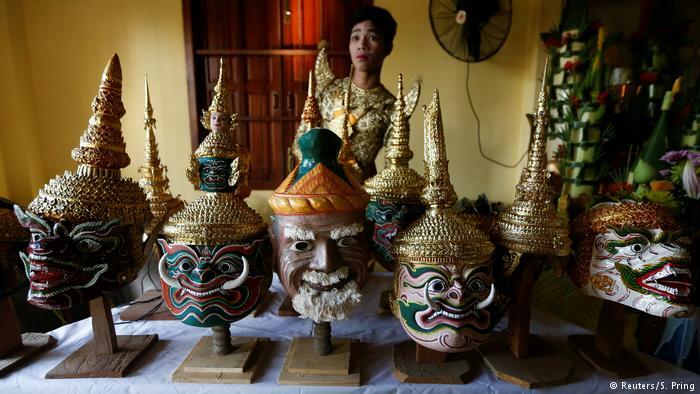 Mom Luang Pongsawad Sukhasvasti, 67, has followed his father’s footstep in making Khon masks since he was 10 and still hand-fashions the masks from his home studio in Ayutthaya province, north of Bangkok. A dancer gets ready before a performance of Lakhon Khol at the Wat Svay Andet buddhist temple in Kandal province, Cambodia. The ultra-Maoist Khmer Rouge in Cambodia – who scorned most art as decadent – banned its study in the 1970s. The art form is still struggling to recover from the genocidal 1975-79 rule, in which at least 1.7 million people, including artists, dancers and writers, died, mostly from starvation, overwork, disease, execution or torture. Each mask takes a month to produce, from moulding the plaster to drawing the intricate details. 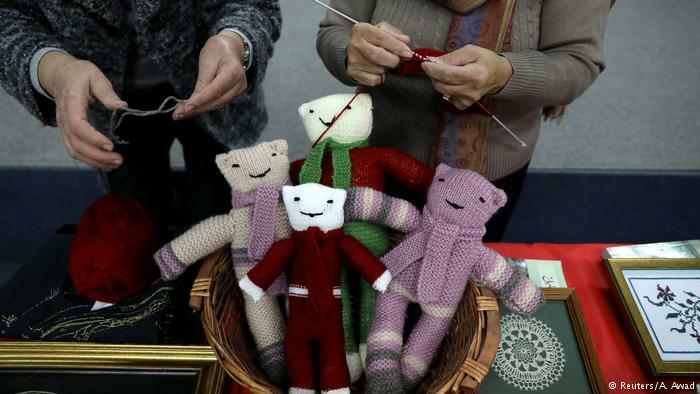 Pongsawad said the UNESCO listing could boost awareness. 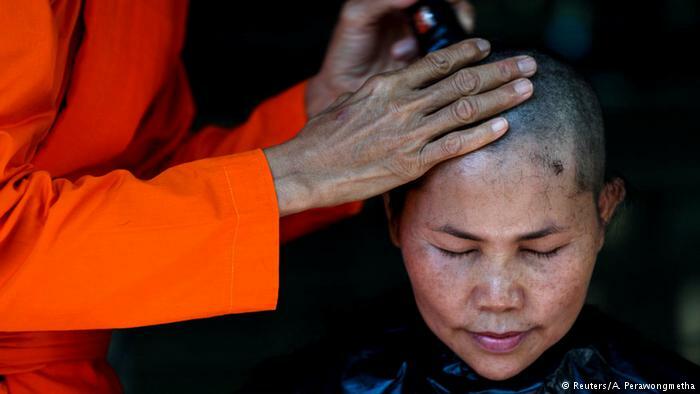 Last month, Boodsabann Chanthawong (below) joined a growing number of women defying generations of Thai Buddhist tradition by becoming ordained as novice monks at an unrecognised all-female monastery outside Bangkok. 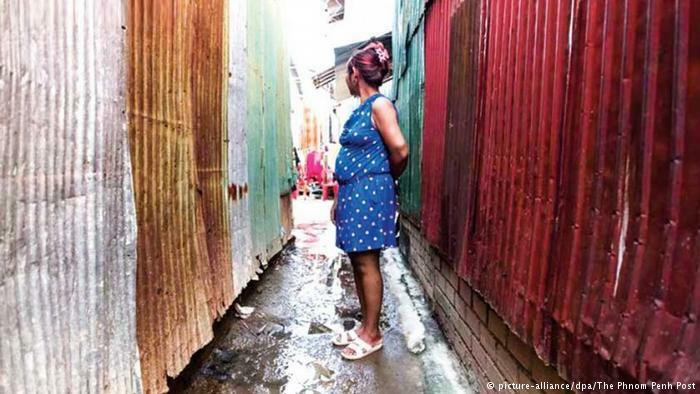 Pregnant and scared, Yin hides in a house on the outskirts of Phnom Penh -- one of an untold number of Cambodian surrogate mothers risking jail time for lucrative payouts from Chinese clients. The end of China's one-child policy has driven desperate couples too old to bring a baby to term to poorer countries in the Mekong region, where a "womb-for-rent" industry is brushing up against legal barriers.